Dyeing with plants is more time consuming and less predictable than dyeing with acid dyes. There is something intriguing about foraging for a plant on our property, I would normally not give a second thought to and creating something useful with it. My latest dye experiment was with a plant called Horsetail. I noticed a large patch growing along the corner of one of our fields. I had never noticed Horsetail growing on our property before, funny how much more aware we become of our surroundings when we go into forage mode. The ratio of plant to wool was 5 to 1. We picked more than enough, without even making a dent in the Horsetail patch. Horsetail is used in folk medicine to treat urinary and bladder conditions and for healing wounds. Loved the post! Have a great day! I love this color, it's very natural and I had no idea you could color dye with horsetail. I really need to learn to do some fun things with my sheep fiber, just haven't gotten around to it yet. 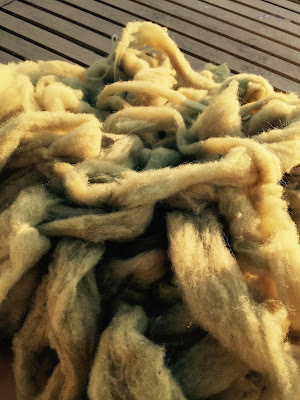 For years I just sold the wool-I am just now getting around to using it myself. It is fun to hear about your experiments, Sandra. From looking at the plant in your pictures, I wouldn't have expected a pink color. Very interesting, thanks! Thank you! I have seen the pale pink, very pretty. I found it surprising As well. I love reading posts like these, it's so neat to see what all you can use to dye things. Thanks for sharing on the Homestead Blog Hop! Fascinating! You have taught me something new today.